It’s called a Boat because it can’t launch a boat, that’s what Ships can do. First – here’s what a Sludge Boat is. This Sludge Boat’s contract was completed on June 12 of 2013, and she splashed into the world a scant 290 feet long. 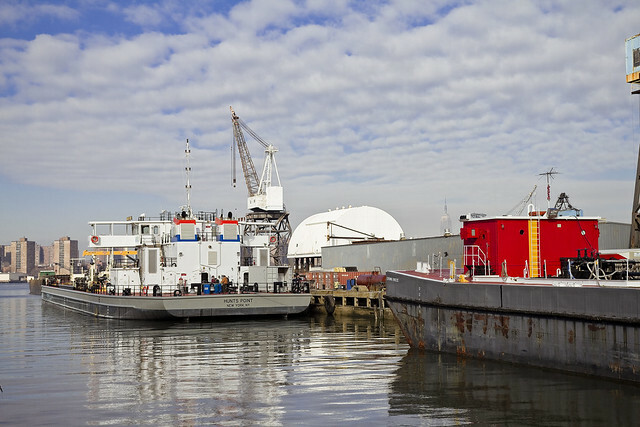 That boat you’re looking at in the shot above is the NYC DEP’s M/V Hunts Point, and she cost $28 million to build down in Louisiana’s Bollinger Shipyards. Word went out that it had arrived at the Navy Yard, so a humble narrator set off for Brooklyn. 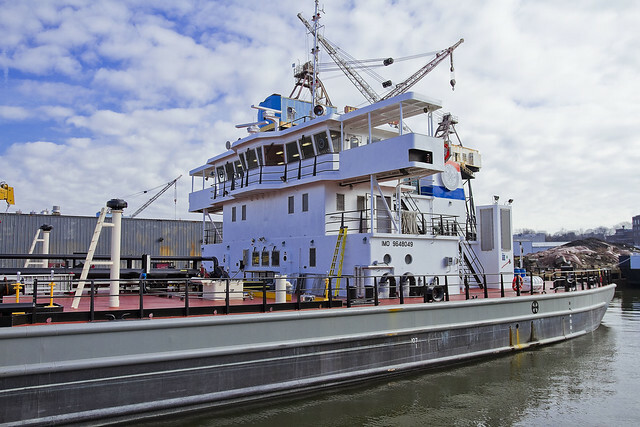 The M/V Hunts Point, the newest addition to the DEP marine fleet, recently completed its sea trials and left its dock in Louisiana for the trip around the tip of Florida and up the East Coast. It is expected to arrive in New York City next week. You can follow its progress here. 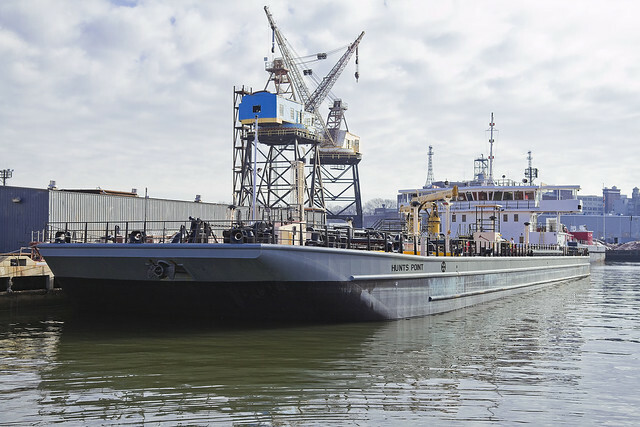 The Hunts Point is the first of three new sludge vessels that DEP has commissioned and it will replace the 1967-vintage M/V Newtown Creek. NYC DEP is a good choice if you need to confess a secret to someone who will never reveal it, by the way, and other than a few nuggets on nyc.gov there has been very little official discussion of this new boat. In some ways, it’s a bit mysterious, but there’s a whole contingent over at DEP who don’t understand the enthusiasm some show for their toys. The MTA on the other hand, actually encourages railfans. With all the mystery vessels that have been presented at this, your Newtown Pentacle, over the years – I’ve developed some small aptitude for discovery. M/V Hunts Point uses call sign WDH2432, has a gross tonnage of 2,772 and is – as mentioned- 290 feet long. Her draught is 4.3m, and the reason that her stature is so reduced as compared to the less modern vessels of DEP’s fleet – it’s so that she can pass under the Pulaski Bridge on Newtown Creek rather than requiring it to open. Municipal sludge vessels have been a part of New York City’s sludge disposal system since the late 1930s. The Federal Work Projects Administration (WPA) funded and built the first three Motorized Vessels(M/V): M/V Wards Island, M/V Tallman Island, and the M/V Coney Island. Before these vessels were available, sludge was routinely discarded into the surrounding waters from the few sludge facilities operating at that time. As a result, the harbor waters became so polluted that incoming traffic would find their hulls cleaned of any marine life. This change in behavior, the current sludge boats dock at the East River in Greenpoint to siphon off the product of the sewer plants’ operation, is predicated upon the scheme of these boats sailing up Newtown Creek from the East River and into the Whale Creek tributary which adjoins it. The boat will attach to a specially designed dock at Whale Creek. M/V Hunts Point is the first of three such vessels. Need for the hated sludge tank and dock at the corner of Commercial Street will be eliminated, satisfying a key complaint of the community, by this operation. Bollinger Shipyards provides new construction, repair and conversion products and services to the commercial offshore energy and marine transportation markets around the world, and to the U.S. Government and naval shipbuilding marketplace from our U.S. Gulf of Mexico facilities. Family owned and operated since 1946, Bollinger maintains ten ISO 9001:2008 certified shipyards and a fleet of twenty-eight dry-docks for shallow draft and deepwater vessels. Bollinger has earned a premier reputation for superior quality, value, timely service and delivery to its customers. A friend who is associated with the Brooklyn Navy Yard brought me in to the place with him yesterday, graciously allowing me to capture these and other shots at the location. 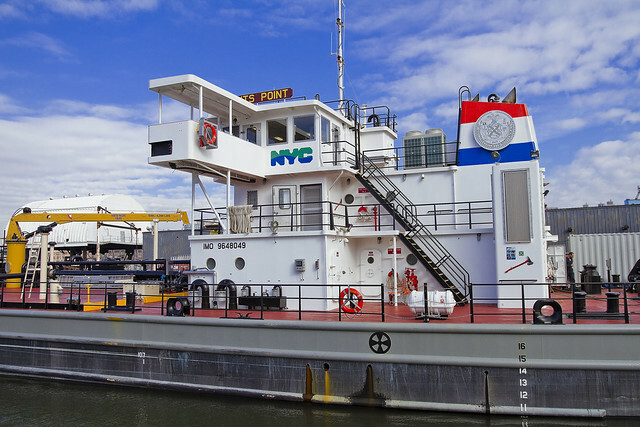 Please welcome, Lords and Ladies, to your service – the M/V Hunts Point, NYC’s latest and greatest Sludge Boat. The United States Navy Yard, New York, also known as the Brooklyn Navy Yard and the New York Naval Shipyard (NYNSY), is a shipyard located in Brooklyn, New York, 1.7 miles (2.7 km) northeast of the Battery on the East River in Wallabout Basin, a semicircular bend of the river across from Corlear’s Hook in Manhattan. It was bounded by Navy Street, Flushing and Kent Avenues, and at the height of its production of warships for the United States Navy, it covered over 200 acres (0.81 km2). $28m!! wow! interesting profile. i’ll be watching for her around the harbor. A reblog this morning from Mitch Waxman. Check out our brand new boat!